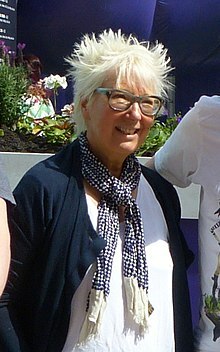 Jenny Eclair (born Jenny Clare Hargreaves; 16 March 1960) is an English comedian, novelist and actress, best known for her roles in Grumpy Old Women between 2004 and 2007 and in Loose Women in 2011 and 2012. Eclair was born to English parents in Kuala Lumpur, Malaysia where her father, Derek Hargreaves, M.B.E., a major in the British Army, was serving in the Royal Marines, Parachute Regiment, Green Howards, Trucial Oman Scouts, and BRIXMIS, had been posted in 1952. Eclair returned to England when she was two years old, and she started her education at Queen Mary school (now King Edward VII and Queen Mary School) in Lytham St Annes. She is said to have adopted the alternative surname Eclair (later her stage name) in her teens, when she was at a disco in Blackpool and pretended to be French. She studied at the Manchester Polytechnic School of Drama and joined a cabaret group variously referred to as Kathy Lacreme and the Rum Babas, and Cathy La Crème and the Rum Babies. After moving to London, Eclair's first job was at Camberwell Arts College as a life model which she did for about 2 terms. She then saw an advert in The Stage looking for novelty acts and found work doing punk poems. In 1989, when she was named the Time Out Cabaret Award winner, she said it "was nice because it's the first time I've ever won without having to run 100 metres balancing an egg on a spoon." After an early appearance as a German hotel worker in Auf Wiedersehen Pet Eclair starred in the ITV drama The Bill and appeared in the early 1990s Channel 4 comedy series Packet of Three with Frank Skinner, as well as the follow-up series Packing Them In. In 1995, she became the first female solo winner of the Edinburgh Fringe Festival's Perrier Comedy Award. In 1997, she played "Josie" in the stage play Steaming by Nell Dunn. In 2001, she published her first novel Camberwell Beauty. Eclair helped develop and appeared in the show Grumpy Old Women as well as a variety of successful spin-offs. Eclair has appeared on BBC Two's Grumpy Old Women and its various spin-off shows. In 2006, Eclair starred in the stage-show Grumpy Old Women Live! with Dillie Keane and Linda Robson. The show was co-written by Eclair and Judith Holder. The spring saw a sell out national tour, June and July a run at the Lyric Theatre in London's West End and the autumn will see another national tour. From 2011 to 2012, Eclair returned as a panellist on Loose Women, a show she was a panellist on in 2003. On 30 May 2012, she appeared on her last Loose Women show and was replaced by actress Shobna Gulati. In 2005, Eclair appeared in the reality show Comic Relief Does Fame Academy..
On 18 November 2010, she joined the 2010 series of I'm a Celebrity... Get Me Out of Here!, finishing in third place behind Stacey Solomon and Shaun Ryder. In August 2012, Eclair appeared in Celebrity MasterChef on BBC One. On 25 January 2014, Eclair took part in the second series of the ITV celebrity diving show Splash!, appearing in the fourth heat. Note* Scores are out of a possible 30 points in total. Until April 2008, Eclair hosted a weekend talk show on LBC 97.3. Her other radio credits include appearing on BBC Radio 4 in the Just a Minute quiz and afternoon plays, various comedy shows on BBC 7 and regularly has covered for Sandi Toksvig on LBC's weekday lunchtime chat show (now defunct). She has also hosted her own show on the London radio station LBC Radio and starred in various stage productions. Eclair sat in for Danny Baker on BBC London 94.9 from Tuesday 30 August until Friday 2 September 2011. Eclair fronts the Food Standards Agency's salt reduction campaign "Salt, is your food full of it?". Eclair appeared at Derby Playhouse in The Killing of Sister George from 13 September 2008 until 18 October 2008. Eclair is married to Geoff Powell as of July 2017. She previously stated that marriages are naff. She is the mother of the playwright Phoebe Eclair-Powell (b. 1990). ^ Lawrence, Janie (13 May 1997). "Naughty but nice". The Independent. Retrieved 15 June 2018. ^ "The Facts: Jenny Eclair". BBC. 24 September 2014. Retrieved 15 June 2018. ^ Fletcher, Ewan (16 June 2007). "Jenny Eclair: My agony over my father's grisly wartime secret". MailOnline. Retrieved 15 June 2018. ^ "Two more stars confirmed for 'I'm A Celeb' – I'm A Celebrity News – TV". Digital Spy. 17 November 2010. Retrieved 23 September 2011. ^ "Weekend Kitchen with Waitrose on Channel 4 at 9:00am May 17th, 2014". Digiguide.tv. 17 May 2014. Retrieved 29 July 2014. ^ "Draw it! on Channel 4 at 4:30pm May 19th, 2014". Digiguide.tv. 19 May 2014. Retrieved 29 July 2014. ^ "Eclair sitting in for Danny Baker on BBC london 94.9". BBC. 30 August 2011. Retrieved 23 September 2011. ^ "Salt TV ads". Salt.gov.uk. 6 November 2009. Archived from the original on 24 January 2009. Retrieved 23 September 2011. ^ Interview by Stuart Husband (7 December 2008). "This much I know". The Guardian. UK. Retrieved 23 September 2011.